The City of Saint Paul is conducting a study to reimagine the potential use of a five-mile railway corridor. Originally used to serve the Ford Twin Cities Assembly Plant, which closed in 2011, the corridor has the potential to be remade into a vibrant recreation and transportation resource that can serve Saint Paul residents well into the future. The study examines opportunities to redevelop the railway to serve pedestrians and bicyclists for decades to come, and considers potential uses for public transit. Land survey work began in April 2017, and robust community engagement and other analyses continued through March 2018. Public input will be a major component of the feasibility study to envision the future possible uses of the corridor. A series of open houses will be held at each phase of the project. Exact dates, times, and locations will be announced as they are confirmed throughout the process and posted here. Owned by Canadian Pacific, the existing railway corridor begins at the Ford Site, turns south, then east, and runs generally parallel with West Seventh Street, ending about one mile from downtown Saint Paul near the east end of St. Clair Avenue. Following an RFP process, the City has chosen Alta Planning + Design as the consulting firm to conduct the study, with partners from Kimley-Horn and Sambatek. The $200,000 study is funded largely through a $100,000 Transportation Investment Generating Economic Recovery (TIGER) grant from the U.S. Department of Transportation. Other funders include Ford Motor Company, East Metro Strong, and the City of Saint Paul. The Reimagine the Railway study is being conducted independently of the Riverview Corridor study currently underway by the Ramsey County Regional Rail Authority. 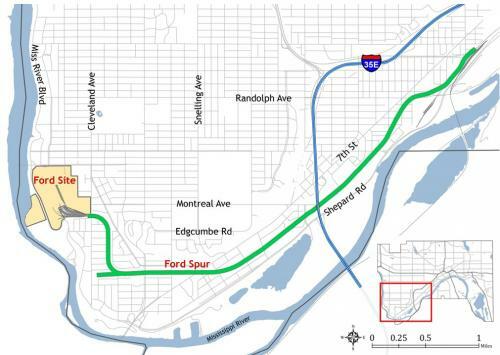 The focus of the Riverview study is evaluating potential routes and modes for a transit connection between downtown Saint Paul and the Mall of America, which includes this segment of the Ford Spur. The focus of the Reimagine the Railway study is an allocation of space within the segment for trails and future transit, whether Riverview or another future route. More information on future Public Discussions will be posted here as they are scheduled. On Tuesday, May 23, a presentation and discussion took place at the St. Paul Jewish Community Center to share information about the study and engage the community in thinking about new uses for the Ford Spur. Meeting materials can be found in the table below. A second open house was held on Tuesday, August 29 at the Palace Community Center to share progress updates, followed by an open discussion where community members had the chance to give the City their thoughts on how they would like to see a trail facility look and function in the future. Meeting materials can be found in the table below. Some additions have been made to these presentation documents for added clarity, following comments received during meetings. Advisory Group meetings are intended for discussion between the members of the Advisory Group. The public is welcome to attend and observe, but due to time constraints there is not an opportunity for public comment or discussion at these meetings. More information on future Advisory Group meetings will be posted here as they are scheduled. 8/29/2017 Open House #2 6 p.m. Palace Community Center, 781 Palace Ave.
3/1/2018 Open House #3 6 p.m. West 7th Community Center, 265 Oneida St.